Build your business network, enjoy some classical music or a one-woman show, or explore something haunted (well, haunted with friendly creatures) this weekend. There are events, activities, and performances for all ages. You can your family can help Nearby Nature prepare for their annual Haunted Hike! They have 80 pumpkins that all need a unique jack-o-lantern face to light the way during Saturday’s event. Open to all ages; bring your own tools! 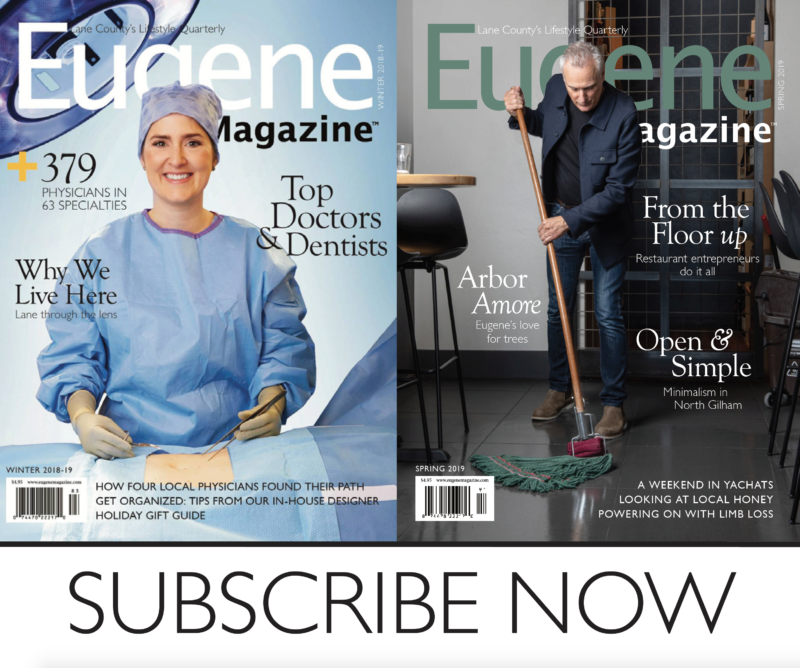 Eugene is at the center of an ever-expanding web of activity–our region is no longer quiet and humble. We are evolving, growing, and leveraging new possibilities and, with every connection, we pull the future towards us. As our networks expand, so do our capabilities and potential. Building for the future has already begun and the Expo is helping carry this important work forward. Don’t miss the 2018 Business Expo and let the future pass you by. The Eugene Symphony is continuing their celebration of Bernstein with his Symphony No. 2, “The Age of Anxiety.” The Symphony will also be performing Beethoven’s Eighth Symphony, which is his shortest and features high-energy rhythms and melodies. To tie it all together, the evening will also feature a performance of Stomp, by David Schiff. Catch a preview of the evening with conductor Francesco Lecce-Chong in the Hult Center Studio an hour before the performance. Country music star Thomas Rhett is bringing his Life Changes tour (following the release of his album of the same name last year) to Matthew Knight Arena on Thursday. He’ll be singing the chart-topping favorites such as “Craving You,” “Unforgettable,” and “Marry Me.” The concert will also feature special guests Brett Young and Midland. Telling the story of her experiences as a Black Latina in the US, Crystal Roman will be performing her play, Black Latinathe Playat the University Theatre this Friday. The play is produced by The Black Latina Movement, a theater and film production company based in New York that seeks to make the entertainment industry culturally and artistically richer. There will also be workshops on Thursday (“Black Latinidad in the USA) and Friday (Beauty: Standards, Appropriation, and Reclamation”). Ballet Fantastique will be performing Shakespeare’s As You Like It, but with a Wild West twist. While the story stays true to the original, the producers and directors worked with a team to work the lines into the Wild West storyline. You’ll be amazed by their choreography, fabulous costumes, live honkytonk saloon piano, and homage paid to American composers. This weekend only! This Saturday, join the pediatric specialties and cardiology teams at PeaceHealth’s RiverBend hospital for a free, 15-minute heart screening for teens. Designed for those aged 12 to 18, the screening includes an EKG, blood pressure check, height, weight, and BMI measurement, as well as nutrition information and a lesson in CPR. Pre-registration online is required. Learn the basics of figure painting with local artist Sarah Sedwick in this two-day workshop. Hosted at Whiteaker Printmakers, you’ll learn in all mediums from gesture drawing to painting in oils. She’ll show you the step-by-step process, starting with gathering your materials. Bring your own materials; you’ll receive a list when you register. MECCA is offering two workshops this weekend to teach you how to put your crafting scraps to good use. Using basic materials, a simple pattern, and a sewing machine, learn how to make a Skelly Doll or learn how to make basic stuffed animals, such as an owl or elephant. The Shelton McMurphey Johnson House is hosting their annual Halloween Tea this Saturday and Sunday. Join them in costume for an afternoon of tea, tea sandwiches, scones and other savory snacks, and the possibly of seeing a ghost wandering the halls, visiting specifically for tea. Help support this local landmark and celebrate Halloween. Pre-registration is required. Nearby Nature is hosting their annual Haunted Hike, giving you and your kiddos the chance to explore the nightly wildlife at Alton Baker Park. Lit by carved pumpkins, a guide will lead you along the trail, introducing you to costumed furry friends before you head back to the decorated picnic shelter for crafts, fun games, and yummy treats. Pre-registration is required–please register your family under one name only. Taste seemingly infinite takes on the best comfort food at the Portland Mac and Cheese Festival this Sunday. The new Portland Food Magazine has paired up with its sister publication Austin Food Magazine to host this event, featuring chefs from all over the US. A ticket includes unlimited tastings, three beverage tickets for general admission or unlimited beverages with VIP admission, and is family friendly. Join them for either the morning or afternoon session for a day of mac, cheese, and delicious choices. The Shedd is dedicating an evening to Frank Sinatra, whose legendary repertoire of songs still hold strong today. On Sunday, see a performance of instrumental versions of his classics, led by Carl Woideck with his group of musicians including Paul Krueger on trumpet, Torrey Newhart on piano, Sean Peterson on bass, and Ken Mastrogiovanni on the drum set. Starting this Monday, head to Dorris Ranch for the annual Haunted Hayride. Ride through the Ranch’s haunted trails, where you might have run ins with the not-so-scary ghosts, zombies, mummies, and historical figures who live there. There will also be games and crafts beforehand with hot chocolate and cookies to help you warm up after. Register ahead of time online or in person. Rye’s pre- and post-Prohibition drink classics pair well with their simple, but delicious menu. Their seasonally changing, rustic European cuisine is fused with Northwest ingredients and features delicious dishes such as the chicken carciofi, bourbon-brined pork chop, or squash ravioli. End your meal with one their delicious chocolates, paired with the perfect sweet mixed drink, Porto, sherry, or other sweet libation.